When The New Democracy first appeared in 1912, it was widely regarded as one of the most influential works of the Progressive Era. Yet, despite continuing interest in the political thought of the Progressive Era, both Weyl and The New Democracy slipped into undeserved obscurity shortly after the author's death from cancer in 1919. 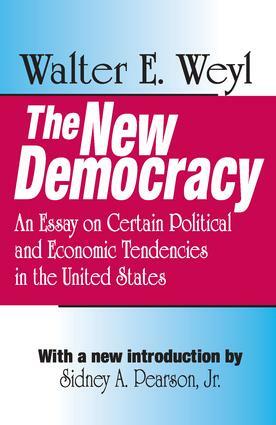 Despite this, Weyl's book remains one of the most important links in the development of a liberal-progressive theory of democracy. Weyl describes the efforts of a plutocracy seeking to control, often by corrupt means, the federal government. He attacks the Founding Fathers' motives, and reads the Constitution as an anti-democratic document produced by aristocrats attempting to protect their own economic interests in troubled times. In contrast to many of his predecessors, Weyl rejects Natural Law and sees the distribution of wealth as the fundamental issue in political life. For Weyl, rights are not defined by Nature, but by human institutions that distribute wealth. He supported a stronger federal government, one that provides more rights and economic equality for the common citizen. In his opening essay for this new edition of The New Democracy, Sidney A. Pearson, Jr. painstakingly explores Weyl's life, influence, political philosophy, the origins of the book, and the author's subsequent descent into obscurity. This classic work will be of interest to students of political science, government, and American political theory.